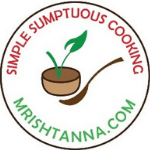 Hey Simple Sumptuous Cooking readers, I am happy to announce my return from a 6-week hiatus. Happy and Belated New Year wishes to all of you. Today, I am sharing the quick and easy way to prepare brown fried rice with my favorite gadget…the Instant Pot. Not only that I am preparing it with brown rice! Given all the hype around brown rice, I thought it would be good to see how well brown rice does in an Instant Pot. The result was a fabulous feast and I am happy to share the details with you! This instant pot brown fried rice is pretty easy to make with just a handful of ingredients. I prepare fried rice often but not with brown rice. That’s partly because it always took a long time to soften up in a traditional pressure cooker. By the time the rice cooked, the vegetables were usually overcooked and too soft. But not so with the Instant Pot. Not only that, the recipe retains all the natural flavors from the rice, vegetables, and spices. The aroma from sesame oil and soy sauce make it an authentic delicacy. Brown parboiled rice (also called brown converted rice) is rice that has been soaked, steamed under pressure and dried, before milling. Cooking time on a Stovetop is 20 minutes. In an Instant Pot, it takes about 8 minutes. Brown rice Short grain brown rice and long grain brown rice this take longer time than parboiled rice. Cooking time on a Stovetop is 50-60 minutes. In an Instant Pot, it takes about 10-12 minutes. Fried rice is always served hot with a side of plain (vegan) yogurt, or if it turns out very spicy, it is common to serve sliced cucumber or tomatoes too. I personally like to eat it with cucumbers on the side. For this brown rice recipe, I used frozen peas and fresh cubed carrots. But you can get a little creative with broccoli, beets, and cauliflower or even a frozen assorted mix of vegetables. Can you spice it up? Absolutely! Once you prepare the brown rice, you can spice it up with sriracha sauce or any Asian sauce. Alternately, if your family prefers a spicy dish, you could add more of the crushed red pepper when you prepare the dish. If you like to eat as plain Instant pot brown rice use the same rice to water ratio. I will say this is one of my best instant pot recipes. A dish such as this is a perfect way to celebrate a rainy wintery day! If this recipe interests you, look for similar recipes in my blog such as the Instant Pot Masala Khichdi or the Spiced Flattened Rice. For more delicious vegan recipes such as this sent directly to your inbox, just subscribe to my newsletter. You will also get a copy of my e-book where I have put together some simple vegan dessert recipes and dessert essentials. My readers have found it very helpful and I am hoping you will too! The quick and easy way to prepare brown fried rice with my favorite gadget...the Instant Pot. Add sesame oil to the inner pot. Press sauté (IP duo) when oil is hot add garlic stirring constantly for 1 minute. Add onions, stirring constantly for 1 minute. Add carrots and stirring constantly for 30 seconds. Add frozen peas. Add red chili powder, black pepper and stirring constantly for 1 minute. Add parboiled brown rice, vegetable broth or water, salt. Stirring constantly for 30 seconds. Close the lid of the instant pot. Turn the steam release handle to “ sealing” position. Press pressure cooking and set the time for 10-12 minutes of pressure cooking. That is such a nutritious and delicious dish. I haven’t used parboiled brown rice – will have to look for it in the grocery store. Thank you Pavani:) you will love the parboiled rice! Welcome back from the hiatus! And let me say that your come back is amazing! This rice is so good I can’t wait to run to the store and buy some for later this week – thank you! Thank April:) sure let me know your thoughts about this recipe. My kiddos love fried rice, and I love that this recipe uses brown rice over white. This is a perfect recipe for our weeknight rotation! I love these fluffy brown rice. And I love fried rice. Looks absolutely delicious!